Nini, the only man in the tribe is close to death. He has survived through so many challenges: colonization, industrialization and globalization. He feels tired of so many things that he does for the indigenous tribe. He is very passionate about his feathers and beads. He transforms them into conduits of a wonderful dream travel. He understands, and teaches the amazing way of dreams that keep him alive. Inside a small teepee in the center of the others, he is in bed, with one brown blanket covering only his feet. His oil-colored eyes are looking up, in the middle of the darkness. Only one small light is reflected by the moon, crossing his small window. His tribe is sleeping between mountains, with oaks moving by the wind. Suddenly, one leaf drops, and Nini’s eyes begin to close. Two leaves drop, finally he closes his eyes. Three leaves drop, he falls asleep. His surrounding now is a beautiful paradise, with the sun, flowers, bees, pollen, petals and seeds. He observes carefully the seeds growing in the middle of the colorful place. Suddenly, something happens and the flowers begin to wither, the bees start to leave, and the seeds stop growing. The earth starts to open into two different worlds. Nini’s oil-colored eyes are full of fire, a fire reflected by the infernal world in front of him. The tribe is sleeping, no one can save him. He needs only to take one more step to fall into hell, but another leaf drops; he wakes up with tears falling on cheeks, and his hands grip his blanket which has traveled up to his neck. The small light through his window becomes a brilliant yellow, a light of Geesis. The sky shows 9:00am by the position of the sun. Nini usually wakes up at 7:00 am, he does not know why he wakes up two hours late. He quickly pulls on his deerskin leggings and breechcloths, and places his special colorful feathers on his head. While he opens his small door, the tribe continues to sleep, and the fires are still smoking. He walks alone through the oaks and treads on the leaves, which guide his way to the top of the stone pyramid. When he reaches the top, the Ojibwe tribe starts to wake up, one by one. Women, children and men wake up to see an awesome silhouette at the top of the pyramid, very close to the sky. It looks alive to them after a night of horrible dreams about men on white horses, wearing fancy suits. In their dreams, the men wanted to take control and exploit their tribe, but Nini fights every single day to keep their original place. When the Ojibwe tribe opened their teepees, something had happened to the oaks: many leaves were on ground with footprints on top of them. In some way, they look awkward today, because waking up two hours late changed most of the tribe’s surroundings. It looks as though someone has moved their fires, their homes, their oaks, and their pyramid toward the top of mountain. Ikway, who is a woman that interprets dreams and ameliorates them through natural medicine, tries to think about who could have moved their tribe and why. Her first thought is that the men with horses had come, and she screams: colonizers! The people do not want to believe her because these men are only in their dreams. Nini hears her voice from his place on the top of the pyramid. He sits down in the Ogimaa seat. He lowers his head, and his oil-colored eyes are full of the silhouettes of his tribe, moving with desperate gestures among the oaks. He needs to go down and try to explain that this situation is only a dream, and that they are not yet awake. When he takes a step, a leaf from an oak falls very slow. His body starts falling down. He takes another step, two leaves drop and his surrounding becomes darkness. Now, he is in paradise again, looking between the mountains. He can see the sun, dropping like fire directly onto the tribe’s teepees. He feels his chest tighten at the horrible image in front of him. At certain times the fire’s reflection illuminates Nini’s face, highlighting his mestizo skin, his snow white hair, and bushy eyebrows. His face looks like a fire, its big red flames becoming more intense. While he is walking, he looks down at the dying and dead bodies, which penetrate in the burning ground, full of their shared blood. As his gaze moves over the destruction he detects increasing pain in his heart. Among the fallen souls, he finds something from the other world; guns, and from his world, arrows. The moment he sees the arrow, his soul sinks into the Ojibwe bodies, which are crying in the sky, seeking their paradise among the destruction. Suddenly, one leaf drops that burns, burning as it falls. Nini starts to feel something in his forehead, a very cool sense. He has weak breath that forces him to breathe deeply, leaving his mouth open. Two leaves drop, and he starts to feel sore in his body. Then, soft hands touch his arms and legs. Three leaves drop, and his eyes start to open to look into deep honey-colored eyes in front of him. Kwayzenhs! What has happened here? Nini says in a cracking voice. “The beginning of colonization Nini” Kwayzenhs says. Kwayzenhs is the only young girl in the tribe, but has a powerful heart full of feelings. She explains to Nini the horrible long fall from the top of the pyramid. As she speaks, he is alive one more time, but during each moment that Nini experiences a sense of fragility, the tribe starts to decline with him. Nini, in his bed covered with a brown blanket over the middle of his body, starts to think about how he can save his tribe from the horrible times that are coming. Next to him, the feathers are laid out on a small table, suddenly they start to float in the air, like a bird free in the sky. Nini’s eyes fill with colors: reds, greens, blues, purples, a rainbow of feathering cascading over his bed. Outside of his teepee, the oak tree has lost most of its leaves, never to return. One leaf drops, and Nini’s eyes vanish in the darkness, the feathers very close to his head, his hairs moving with the air. He is ascending slowly toward the sky, almost hugging the sun and the moon that are connected in paradise. The shine of the sun and the glare of the moon merge in one bright light, covering all damage and destruction in paradise. The tribe’s souls start to return to their bodies, and the men on horses crumble into the ground. New seeds start to germinate, bees come back, and flowers start to flourish. Nini’s smile starts to shine in the middle of the darkness, his pearls showing life in his face. Two leaves drop, Nini starts to wake up. His oil-colored eyes grow with the beautiful reflection of the feathers: Nini now understands the power of the feathers in his dreams. 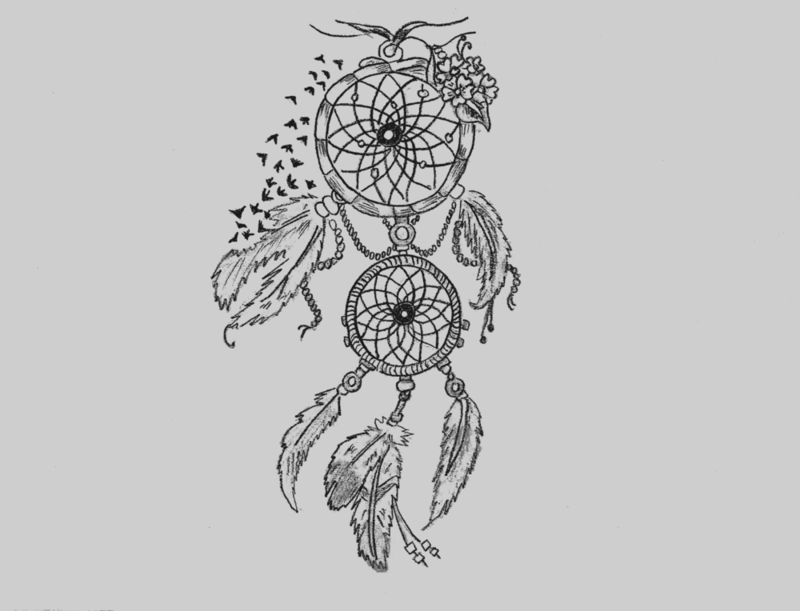 Nini finds the way to save and care for his tribe with feathers: they are a conduit of dreams. This time, for the first time, he sees the tribe has woken before him. The fires, teepees and pyramid return to their original place. At this moment, one of the five remaining leaves on the oak, drop before Nini's feet: a green and orange leaf with special aroma of life, tranquility and peace. Suddenly, thoughts come to his mind about the wonderful world behind of feathers and beans.